Come stay with us and have the River House Experience! Visit our Tee Shirt Store & More! Join MysterE for a Video Podcast Starting in May 2019. A transformational and life purpose revealing community. Our Every Day Question: What Wants To Happen? 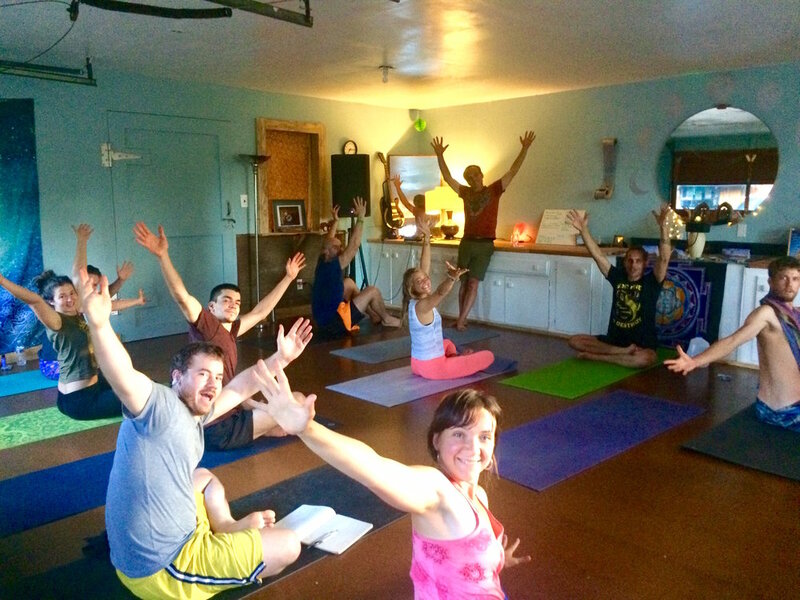 A unique on-going retreat experience on a magical three acres, adjacent to hiking trails 10 minutes from Boulder, Co.
Like traveling to a different country: we speak the language of compassion, use the currency of love and have unique customs. Explore our sanctuary: the waters of our creek, our gardens, labyrinth, art & yoga studios, meditation temple, hammocks & quiet nooks. Let serendipity guide you to meet our community; artists who heal and inspire with listening, food, music, yoga, love & laughter. - To meet other Illuminaries and explore collaboration. - To be heard, and re-write the story of your life. - To experience a different empowered way to live. - To fall in love with the life that you have. - A willingness to discover your gift and purpose. - To heal a broken heart; alone or with a partner. - To rest from busy-ness, and reignite your passion. - To explore Boulder as a conscious community. Participate according to your Heart - Open April 1 - October 31 + Holidays. We make the rest up as we go. 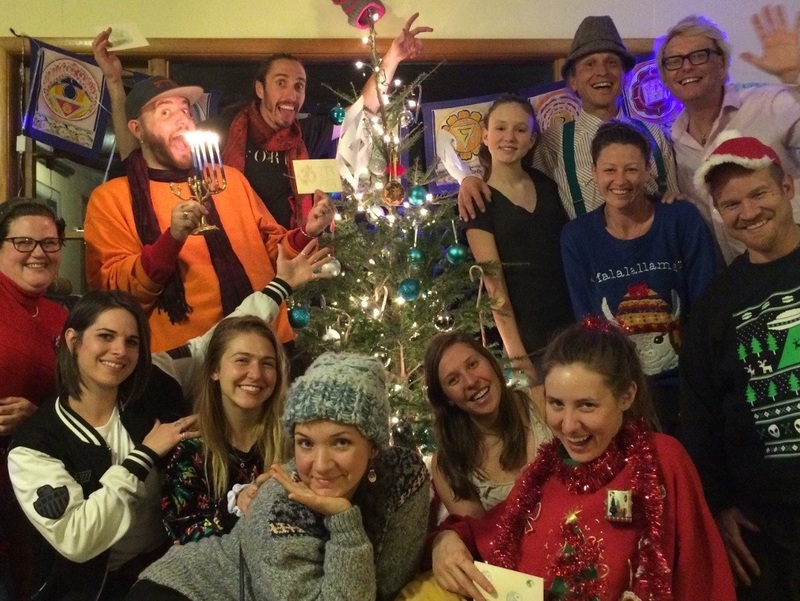 Lunar Ceremonies, Massage, Art & Music Projects, Sound Healing, Hiking and more. Learn more about Udavasana Yoga. 12pm Lunch of Creative Collaboration. Day of rest - Call ahead. Join us for a 4-day weekends around holidays and celestial events. Choose your lodging preference, and book your stay now! Or attend one of our weekly events. Visit the RH for the holidays, a Dead & Co concert, or one of our famous Halloween parties. Come alone or bring your tribe. We offer services for one-stop weddings, to retreats and workshops. Design your event the way you want it. Spiritual teachers, healers and leaders welcome. Ring Master of the River House MysterE School. Yoga Teacher, Author, Musician, Alchemist, Artist and Labyrinth Designer. Lead Udavasana Yoga instructor, Shabbat Community Leader, Kabalistic Magician. A true pioneer. With lots of alchemists, we require a chief. Tom is our photographer, lead sacred geometry designer and energy wizard. Truly a man living from the Heart. Founder of The Kiva Center, Sanar Energy Healing - and principal in Warrior Hearts. The local artists & healers in our community are so attuned, they drop by exactly in tune with our guest's intentions for growth and experience. Community leader guiding transformational journey of healing through breath work, song, and sacred vibrations. Founder of Richii Jai Yoga and a true yoga enthusiast who inspires his student to reach into potential and enjoy the ride of life. Dana distills the complex into the simple to translate yoga postures into life experience. The path is unique for everyone. Come explore yours. We have volumes of videos and life lessons from a myriad of teachers and luminaries speaking about all things compassionate. YOU - Bring Your Gift! We always have room for your gifts in our Creative Dynamic Open Space. Show up and collaborate with us by offering, learning and growing as our guests! 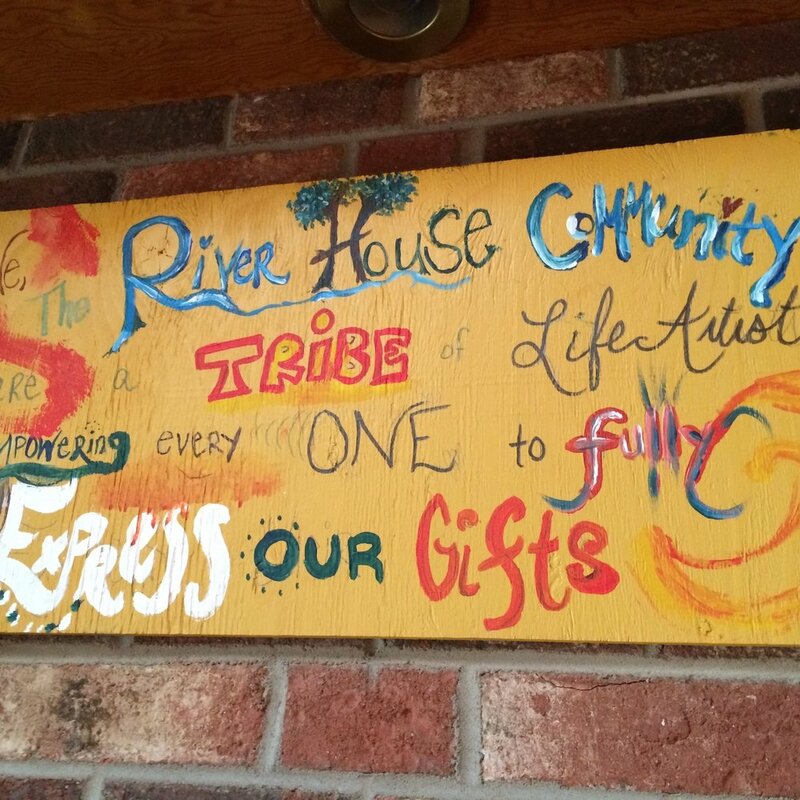 The original sign still hangs in the kitchen to guide us: The River House Community is a Tribe of Life Artists Empowering Everyone to Express our Gifts. Books available below, and much of the art is available on tee shirts, mugs and more at Luv Lingo! Signed copies of MysterE’s book at the River House or click on book cover icon. MysterE's collaborative Abundance Meditation with Massood Taj to listen to in the early part of the day. There are more meditations and music with the Amusement Park Passport. MysterE reads the book that has touched the lives of thousands - who love the simplicity and small pocket size. Hard copy available from Amazon: The book reveals the alchemy for empowering relationships for an awakening of potential. Produced on the River House MysterE School grounds - highlighting community member Ashley Wilfire's voice, as well as MysterE's poetry and impermanent river art. Best listened with headphones. Come stay and see MysterE's river art at the River House. MysterE reads his fourth book which relates his stirring coming of age story about his daughter in Mexico, and how it relates to creating new ways of relating in humanity. Hard copy available on Amazon.